Drawing by Frederick Charles Maisey of the rear view of the North Gate of Sanchi, in pencil and body colour on green card. 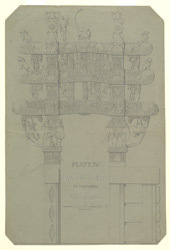 Inscribed: 'Plate IV. Rear View of the North Gateway'. 'F. Maisey del'" Verso: 'Fred Maisey, 67th Regt'. 'Old Plate IV. New Plate IV'. Reproduced in Maisey, F.C. 'Sanchi and its Remains' (London, 1892, plate IV) and as the frontispiece in Fergusson, J. 'Tree and Serpent Worship' (London, 1873). gateways were added at the cardinal points. The North Gateway consists of two square posts crowned with a group of four elephants and two shalabhanjika, females figures grasping the branch of a tree. These support a triple architrave with scrolled ends. The surfaces of the gateway is carved with scenes depicting various episodes of the life of Buddha Sakhyamuni from the Vessantara Jataka and the Chhaddanta Jataka, together with other scenes such as the Miracle at Sravasti, the Buddha's departure from the palace and the temptation of Mara.